Even a person who enjoys cooking as much as I do occasionally has an “I really don’t feel like cooking” day. Sometimes, for me, that means pizza or Chinese delivery. However, most of the time, it means preparing something simple yet tasty. If it is an inexpensive recipe, that’s a bonus! 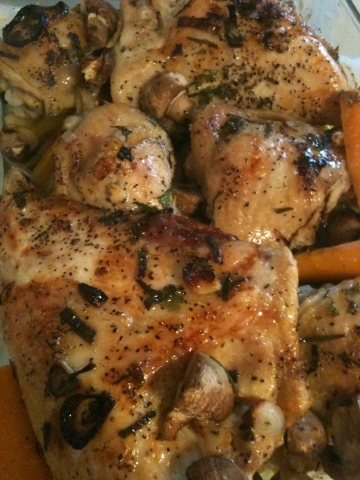 One of my favorite stand-by dishes lately is baked chicken thighs and legs with shallots and garlic, flavored with whatever herbs I have on hand. 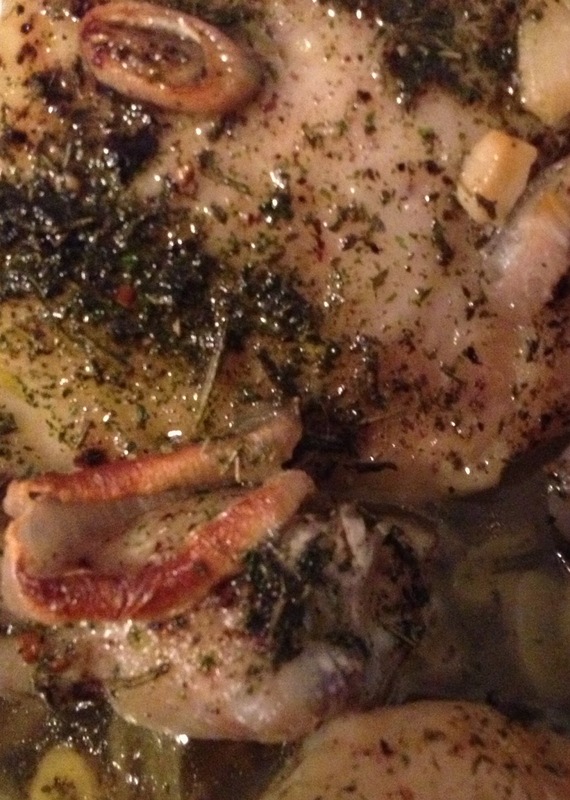 This week, it was the perfect poultry blend: parsley, sage, rosemary and thyme. Such a pleasant ring, wouldn’t that make great song lyrics (wink, wink)?? I always have dried parsley in the spice cabinet. A couple weeks ago, I purchased some recently dried sage and thyme at the farmer’s market. And I still have rosemary growing in my herb garden (though, it’s getting chilly here and I’m about to bring my herbs inside for the winter). I prefer to use fresh rosemary because dried rosemary can tend to have a very hard texture that doesn’t soften even when cooked. I use bone-in chicken pieces with the skin on. I think the meat has better flavor and it’s juicier. You can always peel the skin off after it’s cooked if you are being health conscious. My local grocery store often has the leg and thigh pieces for less than $1 per pound. I figure I feed 4-5 people for about $.78 a person for the meat. Add a vegetable, and you may spend $1 or so a person for the entire meal; considerably less expensive than ordering pizza. This dish smells so wonderful while it’s cooking! Place the dried or fresh herbs in a spice grinder. 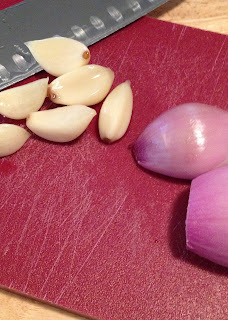 Slice the garlic cloves and shallots. Place the chicken pieces in a baking dish. Salt and pepper the pieces. Drizzle with olive oil. Sprinkle the spice blend over the chicken and add the sliced garlic and shallots. Place in an oven that has been preheated to 365 degrees and bake about an hour. The chicken pieces should be cooked until the internal temperature reaches 165-170 degrees or until the juices run clear from a thigh when you pierce it with a fork. Remove from the oven and let the dish sit about ten minutes to allow the juices to re-distribute. Another great thing about this dish, is that you can use any blend of spices you have handy or whatever fits your taste. You could make lemon pepper chicken by blending lemon zest (finely grated lemon peel), pepper and some thyme or parsley. Another tasty choice would be jerk chicken using a Caribbean jerk blend which can include dried onion, thyme, allspice, ground black pepper, cinnamon, cayenne pepper, and salt. Additional vegetables can be added as well such as mushrooms and carrots. If you don’t have shallots, substitute a small onion. Serve with your family’s favorite vegetable, or with brown rice or mashed potatoes. Whisk up a quick gravy by heating 4T butter and 4T flour to make a roux. Whisk over medium heat until the flour mixture has a slightly nutty scent. Add the juice from the baking dish or canned chicken broth. A combination of both can be used. Continue to whisk to eliminate lumps and add a little water if additional liquid is needed to thin the gravy. Finally, add salt and pepper or a bit of the same spice blend used to season the chicken. With just a little prep time, your family can have a home-cooked meal even on a busy day…Enjoy!